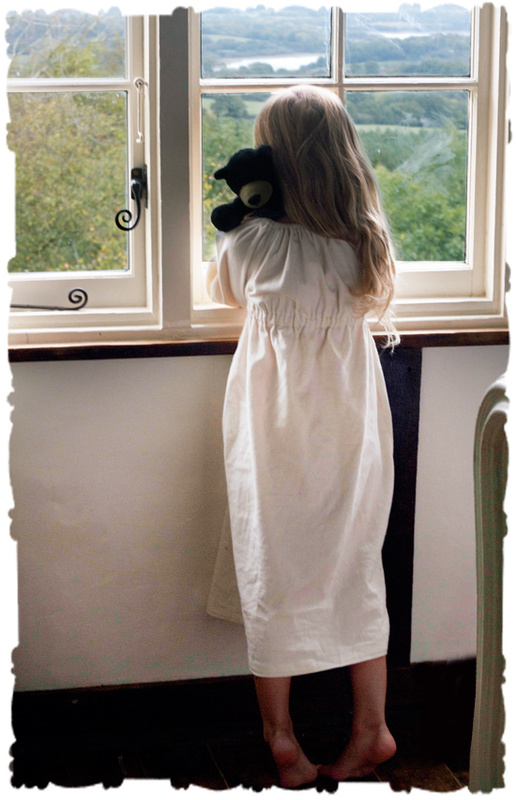 Before the cold weather sets in and returns us to dark, chilly mornings of tending the fire, I wanted to sew our children a warm nightdress each. I’ve had some beautifully cosy organic cotton for quite some time. They’ve been requesting these for months, and planning their design with me, something old fashioned and very simple, long and comfortable. My tall child wants to embellish hers with embroidery and lace as well! Now that my studio is mostly in order, I pulled the fabric out and set to cutting two patterns. I cut a variation of the Molly Peasant pattern that I’d made a summer dress with. It is a child’s version of my own peasant frock, this time using three-quarter sleeves and a much longer hem. I cut the little one’s nightgown particularly large with a plan to adjust the elastic a year or so on, to give her a bit more time to wear it. My tall girl isn’t growing quite so rapidly, though she is set to overtake me and it won’t be long before I can sew the same pattern for the both of us! I’ve shuffled my antique machine toward the window a bit, I like the odd corner it makes with the ladder to the little reading room in the rafters, but I haven’t quite decided how to organise the space I’ve left. What a pleasure to sew again, here! It takes me such a long time to return, but I adore it once I’ve begun and then a hundred projects are added to my list. 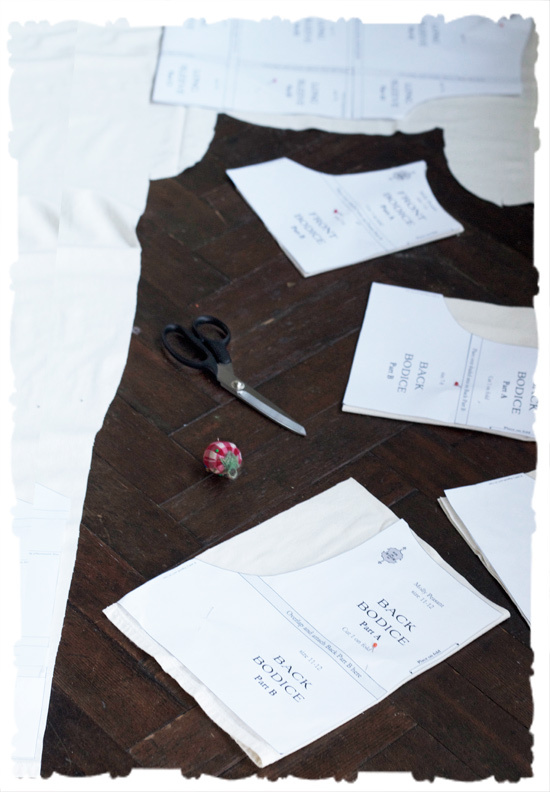 Making this dress is really very easy, I highly recommend it! I’ve finished one little nightdress, to keep our small one warm as she recovers from a fever. She’s very fond of it and wants to wear it all the time. I’ll assemble the tall one’s nightclothes next, I wish I had enough fabric to make a third for myself! And I think a pair of felted slippers would be just the thing to keep them through the cold months ahead, if I can figure out how to make them. Dear friends visited today with a secret, very special sewing machine for our little girls. I’ve hidden it away. 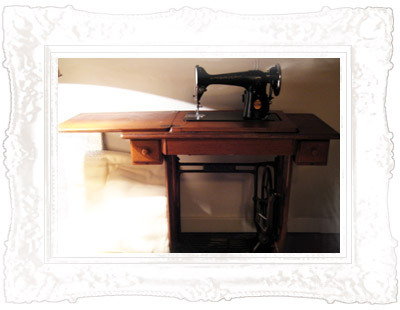 They also set up my vintage singer machine in its treadle table. I’m so pleased to see it like this! I can’t wait to organise the space around it for fabric arts, and settle down to use it. 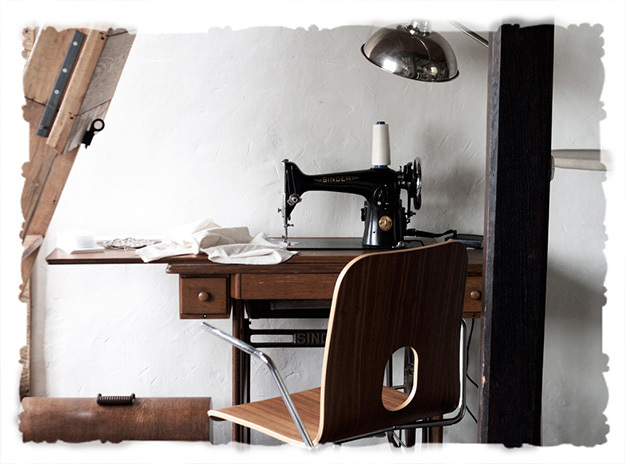 I need to get the knack of sewing with a treadle, working with my feet. That sort of rhythmic work is deeply therapeutic, and largely missing from our electric world – I love that I can use the machine without electricity now. Unlike so many tools, this one has been going for sixty-odd years, and will continue long after us. There’s a long lineup of projects waiting, among them several sets of curtains and quilts to warm our very old house, though winter has eased up here this week. Such a lovely visit, with our children playing sweetly together, and a visit to the village pub.